If you're like me, you already have Luminar and Aurora HDR in your photo tool arsenal. If not... Macphun has some killer deals for the holidays on both products. 3 eBooks from Andrew S. Gibson: Mastering Photography, Mastering Composition & Mastering Lenses. The “Mastering” series is designed to help improve the creative aspects of your photography. They are aimed at intelligent and creative photographers who understand that light and composition are just as important as knowing which buttons to press on the camera. Over 300 high resolution sky overlays: Use Luminar and this set of warm, blue or dramatic skies to enhance any image. Perfect for any photographer who has photos with dull or lifeless skies - bring them to life with this exciting collection! Creative Portraits Preset Pack for Luminar: Make even more amazing photos with this speciality pack of presets ideal for improving any portrait. How to Shoot Sandscapes by Baber Afzal: In this video, you’ll learn pro techniques for capturing the best sandscape photos possible. 2 eBooks by Nature Photography Guides: "Forever Light: the Landscape Photographer's Guide to Iceland" & "Iceland: Black & White Photography Portfolio by Sarah Marino" will inspire your photography to new heights. Creative HDR Presets Pack: Use these exciting new presets to stylize and experiment with your photos. 20-minute Deep Dive video from Trey Ratcliff: Learn from the most influential HDR shooter of our generation, and co-developer of Aurora HDR 2017! 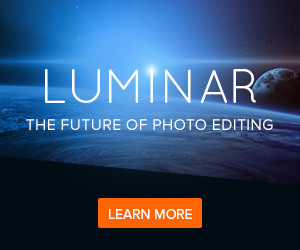 Celebrate the holidays with an incredible deal on Luminar and Aurora HDR. The tools alone will bring a smile to your face. And the extra bonuses are icing on the cake. I'm really digging the Aurora HDR glow effects. And how luminosity masks work is brilliant. Aurora HDR Is Coming In September. For Mac & Windows!